• NBC’s “The Voice” hired Christina Milian as “social media correspondent” to bring a face to the brand’s social media interactions with fans. • Fans prefer to engage with Christina’s personal Twitter account over the show’s official account. • Adapt to the way your audience uses social media rather than dictating rules of social media engagement. On my morning commute I flip between terrestrial radio stations, and today I caught an interview between Carson Daly and Christina Milian, celebs on the singing star-maker “The Voice”. The interview was part of Carson’s morning show on an LA top-40s station, and while the station is part of CBS Radio, he freely uses the platform to promote his other hosting gig on NBC’s musical reality competition. Christina, is the newly appointed social media correspondent for The Voice and she shared her experience using Twitter on behalf of the show. It’s cheesy, yes, but time and again we see that when it comes to social media, we gotta be ourselves. 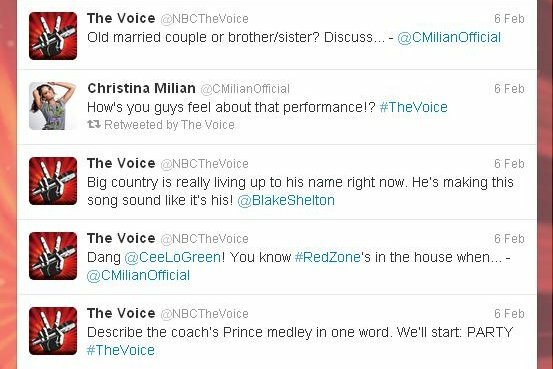 When The Voice premiered following the Super Bowl, the show’s media team had already been all over Twitter, pumping up its ‘net-engaged audience through its official account, @NBCTheVoice. It was interesting to learn from Christina this morning that initially they tried having her tweet from the show’s account to do her duties as social media correspondent. Hey Guys! So instead of tweeting from my twitter rather than @NBCTheVoice twitter feed! So in 30 min #TheVoice airs! 2 hour special! Watch!! The show has a social media correspondent, so you know they’ve got their heart in the game, but they quickly realized this approach wasn’t working. Christina explained that in tweeting through @NBCTheVoice, people weren’t sure if it was her they were hearing from. So, now she tweets for the show from her personal account, happily fusing her own celebrity following with her role as The Voice brandvocate. People don’t identify with a show. They identify with people they can relate to. If your brand has an official account, that’s cool. Just be sure that the people behind the brand shine through. Carson and Christina also talked about the Twitter activity during last night’s show. Christina had a request for fans watching the show and chirping up on Twitter: use the hashtag #thevoice. Treat others the way you want to be treated… even if it’s not how you want to be treated. By leaving out the official hashtag, people couldn’t follow a unified discussion of the show, Christina said. Fans were using singers’ names as hashtags – great, but please use #thevoice, she pleaded. Unfortunately, this is a tricky spot to be in for the folks at The Voice. Tools are often repurposed for uses other than the ones they’re developed for. You can’t tell people how to use the tech tools at their disposal. Twitter is a prime example of this as the lexicon of @s and #s were officially integrated into the platform following users’ invention and use. We can take away from this the importance of adapting to our customers based on their needs and preferences. It’s our job as brandvocates to meet people on their own terms. We’re just making it harder on ourselves if we try to dictate the rules of engagement. Good reminders for the social media marketing community on this day of love and affection. Have a sweet day, valentines.